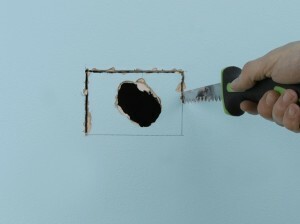 Small holes in hollow walls (stud walls) are tricky to fill as if you just use filler, it simply falls through into the void inside the wall. It is therefore necessary to provide some support for the filler, which is best achieved by using a small offcut of plasterboard. 1. Draw a rectangle around the damaged area with the help of a spirit level. 2. Check for cables and pipes before cutting away the rectangular section of plasterboard with a drywall saw and a craft knife. 3. To make fixing points, thread batten in through the hole, behind the top and bottom edges. Hold the batten in place while fixing through the wall surface into the batten. 4. 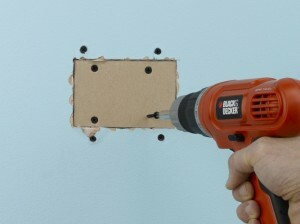 Measure and cut a small section of plasterboard to fit the hole snugly and fix it to the battens with drywall screws. 5. Apply some filler ensuring you cover all screwheads. When dry, sand the area until smooth. A second coat of filler may be required. Make sure your plasterboard offcut is of the same thickness as that used in the wall. Plasterboard is normally 9.5mm or 12.5mm thick. If in doubt, opt for the thinner board as its easy to build up filler levels, but if the board is too thick, it will simply stick out from the wall surface. Make sure that the drywall screwheads penetrate slightly below the surface level of the wall/plasterboard. 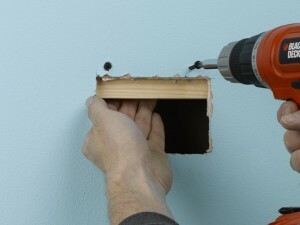 For larger holes in plasterboard, please see my guide – ‘Filling large holes in hollow walls’. This entry was posted on Thursday, September 16th, 2010 at 9:51 am	and is filed under 'How-to' Guides, Preparing Surfaces for Decoration. You can follow any responses to this entry through the RSS 2.0 feed. You can leave a response, or trackback from your own site. Totally agree, in fact I often use this method when filling holes after recessed downlighters have been moved or removed. Thanks for your comment.